by Amanda J. Murray, M.A. Ideal for children and adults to read together – ages 11 or 12 to ?? There is no greater enigma in the English-speaking world than William Shakespeare (1564 – 1616). The mystery is not confined to the true identity of the mind behind the beautiful and life-wise plays and poems, but extends to how did ANY mind have such incredible knowledge of human nature and the skill to communicate his knowledge in drama? This startling insight is one of the most important reasons to still read the plays of Shakespeare and allow one’s mind to be steeped in his entertaining ways of commenting and observing the foibles we all share. Another reason, of course, is the beauty of his language in itself. Our modern language is filled with “one-liners” from Shakespeare’s pen. If there is a linguistic parallel to J.S. Bach, it is Shakespeare. 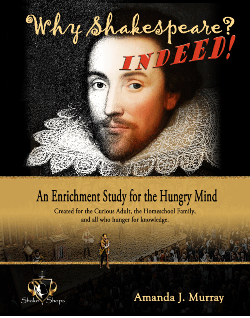 In this very attractive volume, Amanda J. Murray, sheds a very large amount of light on all aspects of Shakespeare. She has provided an extensive and easy-to-digest, self-directed study guide of his writings and times, beginning with a discussion of the 3 men who are the prime candidates for being the true ghost writer of the Bard: Edward DeVere, 17th Earl of Oxford; Sir Francis Bacon and Christopher Marlowe. All 3 possess strong credentials for consideration, being well-traveled, well-educated and living in a sophisticated world – all of which William Shakespeare could not claim, so it seems that the evidence is strong that he has to be disqualified as the true author of the plays and writings that bear his name. But the authorship question has no bearing on the enjoyment and knowledge of Life and the human condition to be gained by reading his work that bears Shakespeare’s name. Ms. Murray also discusses in depth, the mechanics of Shakespeare’s writing techniques, including his regular use of iambic pentameter, which corresponds to our heart beat, with its da-DUM, da-DUM, da-DUM rhythm. She provides examples from plays to clarify this aspect of Shakspeare’s ability. She further discusses his poetic skill in painting with word pictures that describe emotions and thoughts ranging from soft expressionism to stark clarity. She cites his use of the word “light” as having 4 different meanings in this passage from Love’s Labors Lost: “Light seeking light, doth light of light beguile.” The modern translation would be: “Wisdom can be as enticing to intellectuals as daylight to a sighted person.” That is just one example of the word power to be found in Shakespeare’s writings. Another interesting writing device of the Bard is his use of repetition. In spoken language, repetition is very powerful, as the speeches of John F. Kennedy and Dr. Martin Luther King demonstrate. Shakespeare’s listeners were just as susceptible to being moved by repetition and Ms. Murray cites numerous examples. One is the opening speech of Hamlet, which shows us his internal struggle: “O that this too, too, solid flesh would melt thaw and resolves itself into a dew! Or that the Everlasting had not fixed His canon ‘gainst self slaughter! O God, God how weary, stale, flat and unprofitable seem to me all the uses of this world! Fie on’t ah, fie!” In modern English, this statement could be uttered today by any number of depressed people! Another strong aspect of Shakespeare’s writing is his creative tinkering with English that has totally interwoven our everyday expressions: “In my heart of hearts” (Hamlet); “Wear my heart upon my sleeve” (Othello) and on and on. Shakespeare is a colossus of our language in all ways and we owe him a great debt for colorful expressions we take for granted.